It seems that a soon as you buy any sort of electronic item, a newer, better and more modified version comes along. Society has become used to disposing of electronics and moving on to the next one, without giving much thought to the damage it might be doing to the environment. Below are a few ways that you can begin to make a difference and recycle these products the right way. One of the most sensible acts you can do with recycling electronic items is to give the unneeded and unwanted items a new home. Take the time to find an individual that might need a used DVD player or cell phone. It has inherent value to others if the item still works. It will clear the item from your home and offer a wanted item to someone else. Another easy way to recycle electronic items is to have them fixed when they break. They can then be reused by you and your family, sold or given away. Every item you save from the landfill benefits the earth. Cracked screens on computers and cell phones are relatively simple and affordable fixes. Computers and televisions may need new parts that are not that expensive to have replaced. The cost is usually much more affordable than buying a brand new item. Electronic products that have not been badly damaged normally have a few parts that can be pulled out and used to repair other units. Consult with a recycling professional to see what can be harvested from your old unusable items. It helps the recycling effort to provide ways to minimize the need for creating new replacement parts. 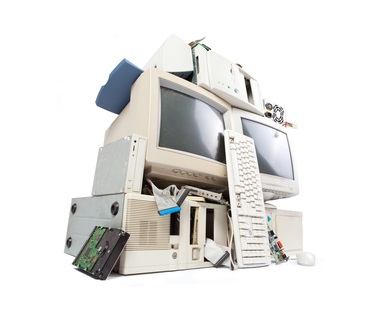 There can be multiple types of recyclable materials to be gathered from any one particular electronic item. There are usually precious and recyclable metals like copper, gold, platinum, silver and steel. Many of the plastic casings and internal parts can be recycled and put towards making new electronics. You could potentially find more information at Ontario Electronics Stewardship,which has additional resources available on their website. There can be hazardous chemicals and components in electronics that can harm humans and animals. Things like lead and lithium batteries can be harmful or fatal if handled wrong and accidentally ingested. These are not items that you want to throw away in the trash can. The chemicals can seep out into the ground and pollute drinking water. Contact your county officials and find out the proper method for disposing of these chemicals. Each area is different, but most have a central drop-of point. Contact a local electronic recycling expert if you have a few items that need to be recycled today!